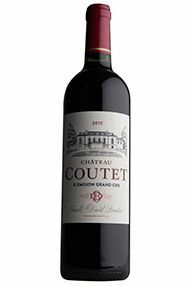 Château Coutet spreads over 14 hectares, 12.5 of which are vines, less than one kilometre from the town of Saint Emilion, to the western point of the Mazerat plateau. The vineyard is in the shape of a triangle, the sides of which are the two Maynes (Grand & Franc), the two Beausejour (Bécot & Dufau-Lagarosse), and Angelus: the golden triangle. A lot of other Premier Grand Cru Classé, like Ausone, Canon, Clos Fourtet are within 500 metres’ reach. Nature at COUTET has been particularly preserved: neither weed-killer nor pesticide has ever been used. It is one of the rare places in the Saint Emilion area where there are still a few small woods of “Quercus Robur” oaks. A fair number of fig trees are to be found here and there. Several varieties of orchids can be seen on small pieces of dry grassland. Nature itself, the wide variety and the vigour of its soils enable COUTET to produce high quality grapes all the time, making the winemaker’s work easier. The property is made up of over twenty odd plots : Cucurot, la Toumièle, le Canon, les Blaireaux, le Squelette, les Vendangeurs, la Porte Rouge, les Pommiers, ….etc, each having its own specificity. They result from the History of this estate. This is another top-quality offering from Ch. 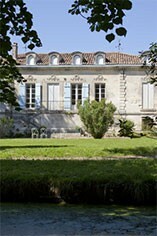 Coutet, a hidden gem in the heart of St Emilion. The nose here is ripe and true to the vintage with plummy cassis fruit and a hint sweet spice. The palate is supple with cool juicy fruit on the mid-palate, a hint of minerality and a lovely freshness on the finish. A well-made wine from an estate which has been organic since day one. Try it with slow-cooked lamb dishes. Drink now to 2035.